There is a certain sense of irony in it: while trying on a new Audemars Piguet Royal Oak Offshore I realized during the 2018 SIHH that current trends seem to favor smaller watches. The Royal Oak Offshore naturally felt profoundly huge on my wrist. That is a good thing because some things in life are at their best when they are huge: engines in American sportscars and, according to my esteemed colleague Robert-Jan Broer of Fratello Watches, schnitzel are just two great examples. I was therefore quite pleased that the Royal Oak Offshore collection remains large (even though the re-edition of the original Royal Oak Offshore felt somewhat modest at 42 mm) and that Panerai has kept the new Luminor Logo at its original 44 mm. For the rest, it seems that the watch world has finally returned to its senses with smaller sizes. And that is a good thing. I have always been a strong advocate for smaller case sizes, and this goes beyond the modest size of my own wrist. Less is more, and regarding the size of watches the full realization of this came during my years in college. At the time I was working in an upscale men’s clothing store to earn money to – you guessed it – feed my watch addiction. On a hot summer day a customer came in, a big man with muscles like Sylvester Stallone all on display due to the polo shirt he was wearing. Strapped on his wrist was a watch you wouldn’t have expected: a yellow gold Cartier Tank Franҫaise Yearling on a light brown strap. It looked amazing there. Why? Because it was smaller! It was a stylish contrast to his physique, not only because it was a gold watch but also because smaller watches don’t cover the entire wrist when you look at it, but also leave room for the strap to play its role. Most watch brands don’t let their customers go suddenly back to smaller case sizes, but tend to take a more sensible route by releasing a new model in two sizes like Girard-Perregaux did with the 2018 Laureato Chronograph. While many men would automatically pick up the 42 mm version, I found the 38 mm size actually more pleasing. Its appeal is in the details: the spacing of the subdials is more organic, and the date is placed close to the chapter ring rather than adrift toward the center of the dial. But it is details that make the difference! And smaller watches mean that details are more concentrated. And that is another reason why I feel that on a man’s wrist a smaller watch makes more of an impact. Cartier followed the same strategy as Girard-Perregaux by releasing the new Santos de Cartier in two sizes: Large (39.8 x 47.5 mm) and Medium (35.1 x 41.9 mm). The Large occupies a middle ground between the former Santos Galbée XL and the Santos 100 Medium, while the Santos de Cartier Medium goes more in the direction of the original Santos Galbée’s size. 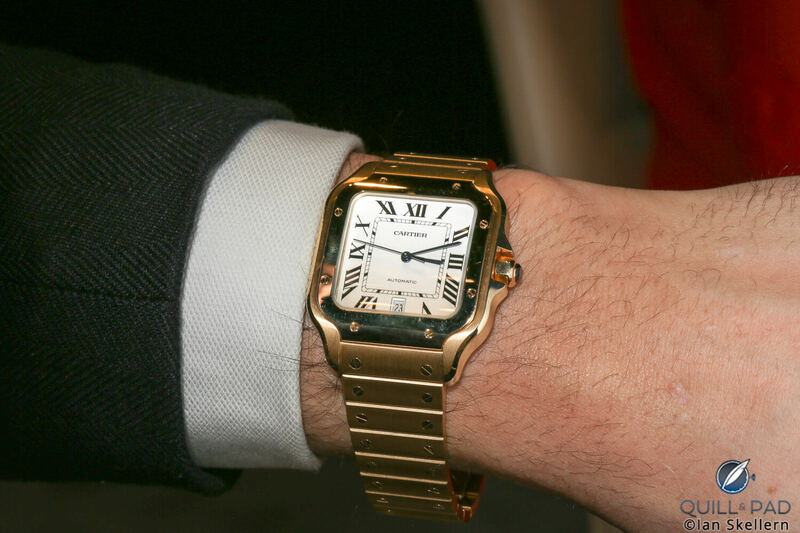 By introducing just two sizes, Cartier covers the vast majority of the men’s market without going too large or too small. This is a very sensible strategy, as it also kills two birds with one stone. While the sizes of men’s watches are coming down, women continue to like larger watches, yet most have wrists too small to comfortably accommodate oversized watches. With their new additions, Girard-Perregaux and Cartier also cater to this part of the market: women might pick up the smaller sizes more easily than men, taking a step in the direction that I think all watch brands should follow: make your entire collection unisex! Why brand a specific size of a watch as a “man’s watch” or a “woman’s watch”? Let consumers decide for themselves and don’t be surprised if it makes you more competitive as a brand on the market. Streamlining production, as offering fewer sizes would do, saves money and makes a brand’s lineup far more clear cut. It might also even help sales as people always love to have a lot of choices; the vast majority of consumers only get indecisive when confronted with many options. What also helps is that watches are getting thinner as well. The well-publicized battle between Bulgari and Piaget for the thinnest of all time amplifies this, but across the entire market, thinner watches are what we are seeing. This is somewhat of a paradox as a thinner watch is, in general, more wearable than a thicker watch, so it would allow us to wear even larger watches more comfortably. Yet that doesn’t seem to be part of the trend. With the advent of the Altiplano Ultimate 910P, Piaget once again wears the crown of the thinnest automatic watch in the world. At 4.3 mm in height, it is indeed incredibly thin; yet with a diameter of 41 mm, it is not the smallest watch. In fact, it is 3 mm wider than the manually wound Piaget Altiplano 900P, but on the wrist it doesn’t seem to look that way. Thinner watches also wear smaller, making the trend of smaller diameters perhaps even more noticeable. But above all, they are also far more comfortable on the wrist! Rolex should pay attention to this trend – I’d love to see a Explorer 1 re-released in 36mm, Submariner in the original 38mm, a Sky-Dweller below 40mm…. I like your train of thought, Camilo!